The Economics of RTUs. 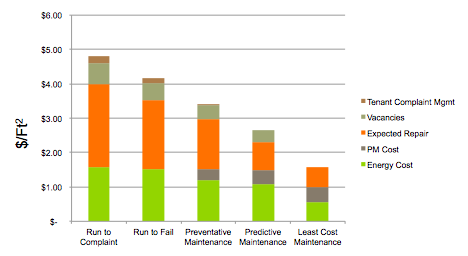 What is Least Cost Maintenance? My previous post, Best Practices in Building Maintenance. Reactive, Preventative or Predictive?, summarized a DOE study, which described the costs of reactive ( or “run to fail”), preventative, predictive and even reliability centred maintenance, to maintain existing building assets. With each improved level of maintenance, the study authors found significant maintenance cost reductions. I believe that there is another strategy, Least Cost Maintenance (LCM), which promises to deliver even lower overall costs of operations. LCM expands the scope of maintenance, to combine asset maintenance and energy management strategies, to reduce the overall cost of operations. It is the first strategy to include future energy, and maintenance costs of each piece of equipment in a maintenance strategy, which also contemplates replacement of the core technology within the scope of the maintenance strategy. LCM is simple in concept, as Replacing air filters illustrates. This strategy considers the cost of installing new filters versus the cost of higher energy consumption caused by dirty filters. Whereas preventative maintenance will schedule air filter replacement (regardless of energy cost), LCM will attempt to determine the point in time where replacement makes economic sense; where replacement will result in least cost operations. To accurately make this assessment we need better information about expected installation costs, energy costs, and technical information about airflow through specific filter types (with different dirt levels). What if we apply the LCM concept to management of your rooftop units? Rooftop units or RTUs generally have an expected useful life of around 15 years if adequately maintained. Poor maintenance can shorten that life by several years. Exceptional maintenance may extend unit life. Age is also important to the energy efficiency of the units. Older units are less energy efficient, by design, than modern high performance units. Dirt accumulation, physical wear (possibly due to lack of lubrication), corrosion, deterioration and physical damage all contribute to additional efficiency loss over time. Replacing a 10-15 year old unit with a modern high performance unit can improve energy efficiency by 50 percent or more. In my review of over 3,000 RTUs in the BuiltSpace database, approximately 25 percent are at, or beyond, the 15 year expected useful life. Like the air filter example above, a planned RTU retrofit or replacement program can reduce overall operating costs, if managed with a LCM strategy. LCM requires new management processes which incorporate knowledge about cooling/heating loads, energy costs, asset condition and service history, expected future repair or replacement costs, and the effective efficiency outcome of replacement of units. I believe, that LCM fundamentally changes the economics of operating facilities, with the potential to save $1-$1.50 per square foot annually across large portfolios of RTU equipped commercial buildings. BuiltSpace has the technology to implement LCM today. Early this year we will beta test our RTU Management Program. If you are interested in participating, please contact me. Transform your business into a digital leader, let's discuss how!